Looking for something to keep you busy during the long winter months that doesn't require putting on 50 layers to go out in subzero temperatures? Why not try your hand at needle felting? Needle felting is the process of using a barbed needle to entangle wool fibers and turn them into something denser and more sturdy, namely: felt! Essentially, you take a small piece of coloured raw wool, stab it with a special needle, and the barbs on the needle tangle up the "scales" of the wool until it becomes felt. You're then left with something you can use to make almost endless creations. 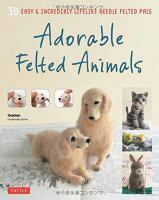 What's so great about needle felting is that it's much easier to learn than other crafty hobbies like knitting or crocheting, and the materials are relatively cheap to purchase. I had never heard of needle felting until a few months ago when I was shelving books here at the library and I stumbled across our small but mighty collection of books on the topic. The adorable little animals and creatures caught my eye and I mentioned to a few key people in my life that it was something I wanted to try out. Lo and behold, over Christmas this year, I was gifted a kit of essential supplies for needle felting, as well as the book Little Needle-Felt Animals by Gretel Parker. This book is wonderful for beginners! 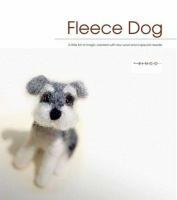 It starts out with a very comprehensive introduction to needle felting, going over the basic techniques required and what materials you will need to get started. It also includes step-by-step instructions on how to create 30 animals. The instructions are illustrated, detailed, and really easy to follow. I started out with making a pig, and while mine was certainly a little lumpier than pictured in the book, I did find it really fun and quite easy to do, and I feel quite confident that my finished products will improve with practice and time. 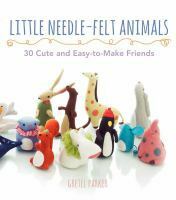 Adorable Felted Animals: 30 easy & incredibly lifelike needle felted pals from the Gakken Handmade Series, includes instructions for 30 more felt creations. When I first saw this cover I was worried because they were so lifelike that I figured they would be a little too advanced for me. But,the instructions here are so detailed and they start from the most basic of the basic techniques, making these designs totally manageable. This looks like a fun hobby to learn over the cold winter months!